Sadly Bess came back to us on Saturday 20th April 2013 following her owner's death. Bess is a lovely black ex-racing greyhound who was born on the 14th August 2006. 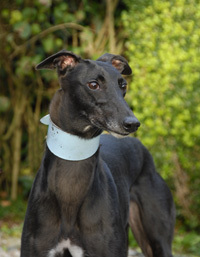 She was with her ex- owner and trainer since a pup and is quite delicate and gentle. 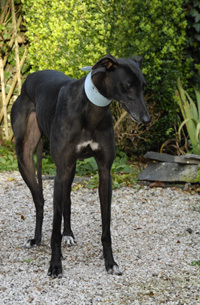 She is very friendly, adores children, walks lovely on the lead and travels well in the car. 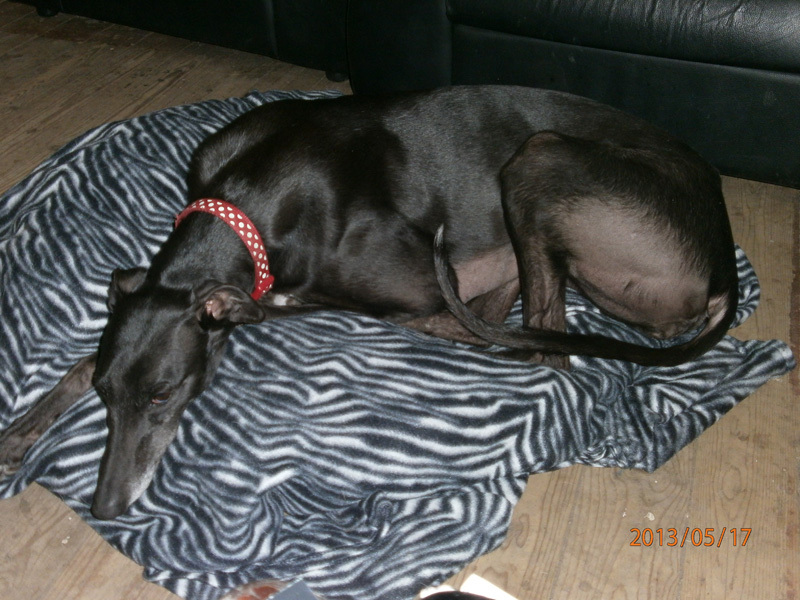 After living in a loving home for 17 months Bess came back to us following her owner's death and following a short stay in foster care she found her forever home on Saturday 18th May 2013..
We received another email later this evening from Julia letting us know that Bess was now sleeping very close to her feet, she came to her half an hour ago, and Julia didn't look at her, she then stayed while she stroked her. Julia then got up and walked outside and Bess followed her, so she walked around for a minute or so and Bess did the same. When Julia came in she followed. This isn't surprising really because Bess was with her previous owner since she was a pup so leaving her kennels into a home environment and with strange people must be very daunting for her. 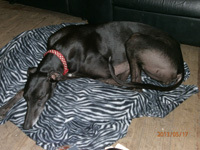 However, she is a lovely dog and I'm sure that within a few days she will be more settled and loving her new way of life. Julia phoned to discuss an issue she has with Bess because she can't get her to come to her. I explained about Lester, what had happened to him and how, because he wouldn't come to anyone I taught him to come to me using Maltesers, which, when the penny dropped worked a treat. Julia tried the Maltesers, but Bess wasn't interested, but small slices of tinned hot dog sausages made her 'eyes pop' with excitement. 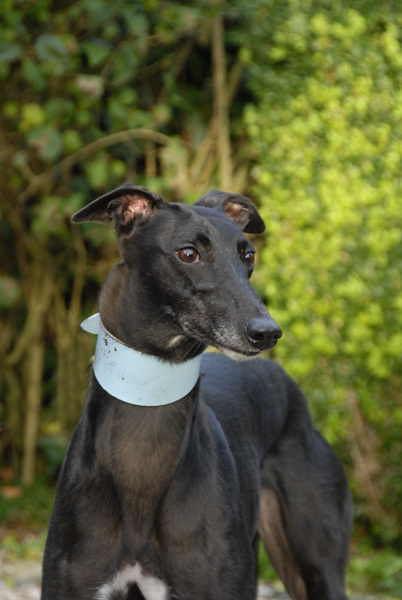 Bess's previous owner told us she was very difficult to catch when off the lead and we've just discovered the full story, which we are glad we were told because it has a huge bearing on where and with whom she will be re-homed. Bess was apparently notorious for not wanting to be caught after a race, and no matter how many people tried it was always so difficult. So as not to hold up the racing Bess was always placed in the last race because then it didn't matter how long it took to catch her. No matter what her previous owners, their friends and associates did they always struggled to catch her. Julia is therefore going to use the tactics I used with Lester and will always walk her on a lead and not let her run until she can get her to come to her every time using the sausages! Once she can get her to come to her she will come and give her a run in our small paddock to encourage her recall. The art with trying to get a dog like this to come to you is to crouch down to their level, offer the treat, but be side on to them, not look them in the eyes and only use the recall words you are training with. Over the weekend we received a call from a lady whose collie had suddenly died of a heart attack on the Friday and she was lost without her companion. A long chat on the phone and time for the lady to think about things resulted in Julia and I visiting the lady today. 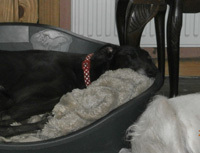 We took Bess with us as we felt Bess would make an ideal companion for her. The lady said she wanted another companion as soon as possible so we took everything with us to do an adoption should the home be suitable and all was well. The moment Bess walked through the door the lady fell in love with her. Bess made herself at home, had a good look round the living room, kitchen and garden, rummaged through the toybox looking for squeaky toys and bones, had a drink of water and lay in the dog bed already positioned ready and waiting. Another explore around the living room then she lay down and went to sleep with her head on the lady's slippers. Another long chat with the lady led us to completing the adoption paperwork and while Bess was being given a treat by her new owner Julia and I slipped away so as not to cause Bess any distress. Both Julia and I believe this is the perfect home for Bess and we wish her a long and happy life there. 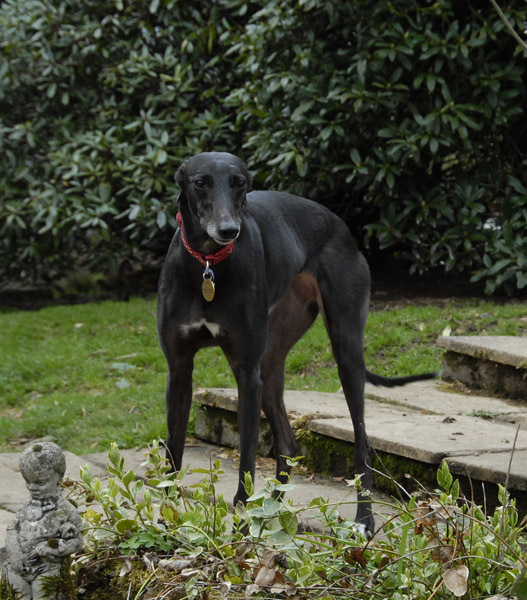 Her new owner doesn't believe in dogs being off the lead other than in her garden and understands the problem of trying to get Bess back should she get off the lead. Her previous dog had so many friends he got 25 Christmas presents last year. 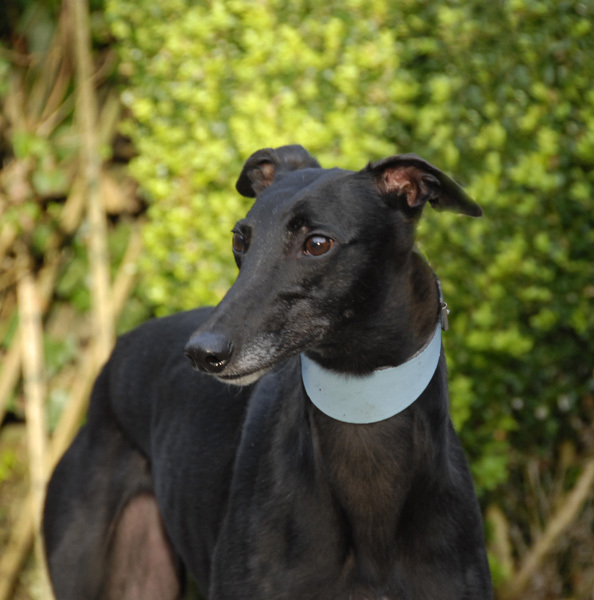 Bess is a stunning greyhound with a beautiful nature so is sure to win the hearts of whoever sees her. We received a phone call this evening letting us know that Bess was fine. 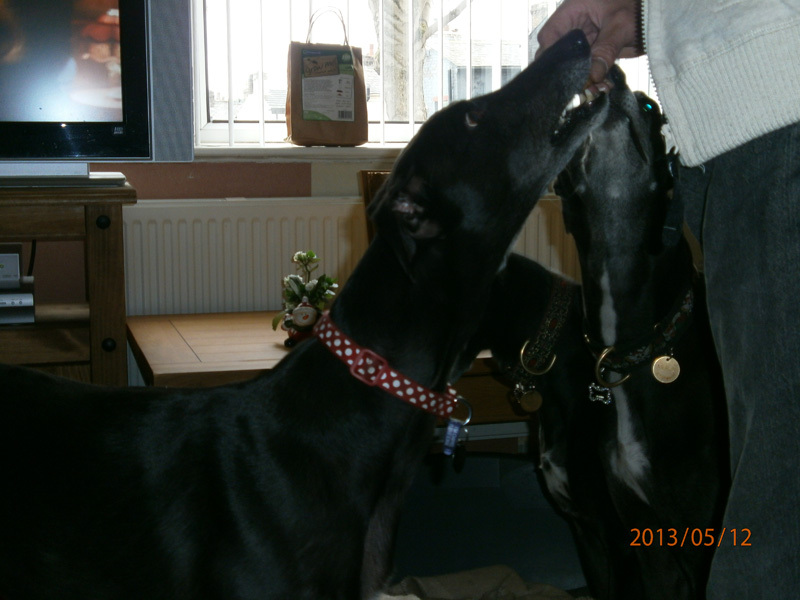 She's had 3 lots of visitors come to see her already and she greeted them all. She's had her tea, been for an explore around the house including the bedroom and bathroom and has quite taken to her new bed. 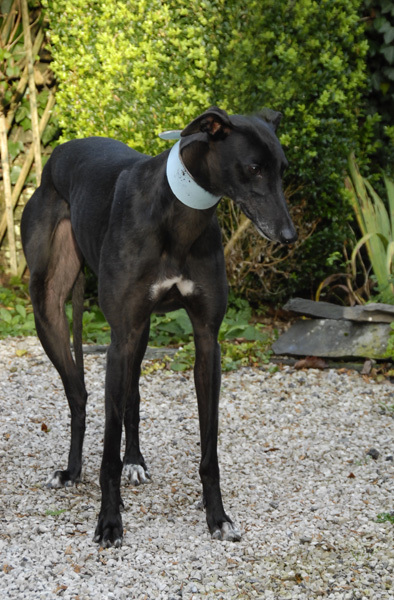 We received a phone call this evening from Bess's new owner to thank us for finding her such a lovely companion. Bess loves children and the two who come round to feed the horses at the weekend thought her wonderful. One of them lay on her bed with her giving her a cuddle. People keep phoning as they hear about Bess's arrival asking for her name so it can be included on their Christmas cards. Her new owner says she is a delight, sleeps in her bedroom and goes in the garden to do her toilet before coming straight back inside. 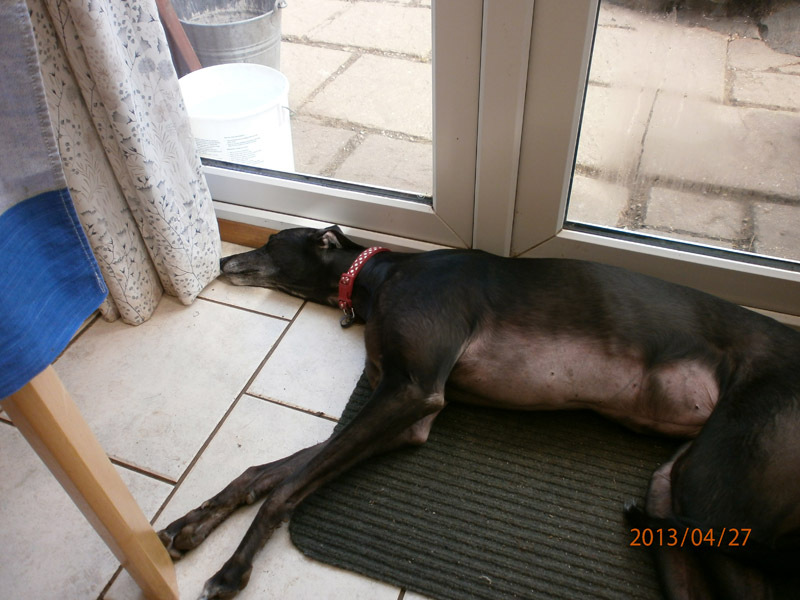 We heard this afternoon that Bess ate her owner's Christmas dinner - oh dear! She only turned her back for a while to get a drink and found half of it eaten when she turned back to get it. She said she wasn't cross, only with herself for forgetting Bess is taller than her previous dog, and with not having her very long they are still getting to know each other. Her owner has lost a slipper - can't find it anywhere, not even in Bess's bed where she takes everything that takes her fancy. She adores squeaky toys, so is not allowed them at night in the bedroom in case she decides to have a play in the middle of the night! Everyone loves Bess, all her owner's friends and neighbours spoil her rotten and bring her biscuits, and she loves the children who look after the horses when they come to visit. 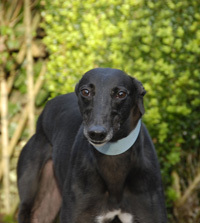 We heard today that Bess's owner thinks she is the most wonderfull greyhound in the world. She has a new game whereby she loves catching birds and bringing them in the house, letting them go to fly around until someone can catch them and return them to the garden. It's Bess's birthday soon and her owner is sending some birthday pictures for us. The people living next door love her and are always buying her presents. 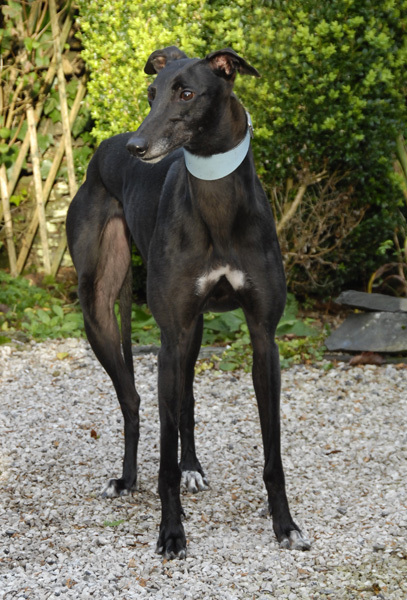 Sadly the owner of Bess passed away and we received a phone call this morning asking if we could have Bess back and find her another forever loving home. This is at the request of her owner. Of course we said yes, and this afternoon Bess arrived with all her belongings. 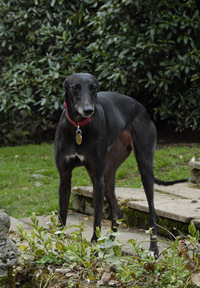 A little confused to begin with she soon settled with our greyhounds. Had her tea, a walk and explore around the garden and when it came to bed time she slept on a dog bed by my side of the bed. This afternoon Flower and Colin called to collect Bess because they are going to foster her until we find her another forever home. Bess travelled back with with them and was super on the journey - just lay down and went to sleep. 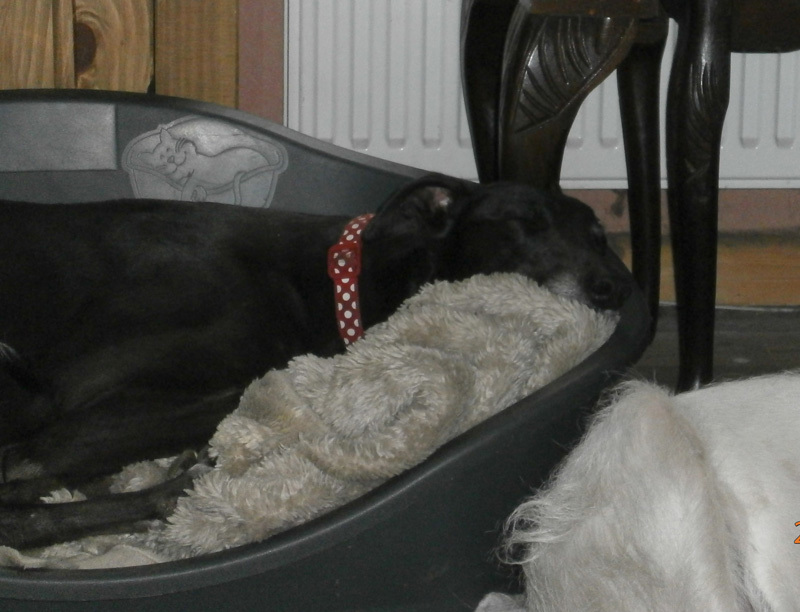 This evening Bess took herself off to bed along with Flower at about 8-30pm and there wasn't a peep from her until it was time to go out to do her last lot of toilet. She also appears to take the three other dogs in the household in her stride and put Lenny in his place when he tried to entice her to play chase in his normal boisterous way. She didn't mess about and he took notice of her reprimand straight away! This afternoon a retired couple who recently lost their elderly dog called in to see Bess. Needless to say, they immediately fell in love with her, so completed the adoption paperwork and bought her a new walking out coat. 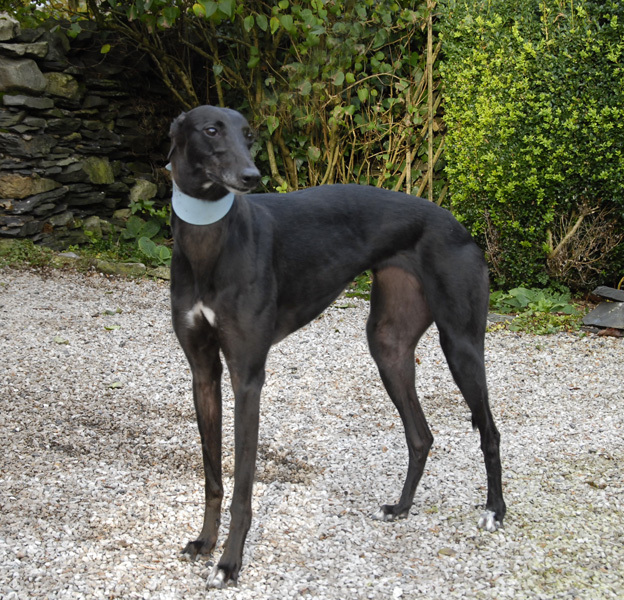 She happily walked down the drive with them and jumped in the back seat of their car, settled down and off she went to her new home where we hope she will have a long and happy life. We heard today that Bess is keeping well. She's made the conservatory her home because she loves the sun. She gives them a lovely greeting when they come downstairs each morning and she goes everywhere with them.